Parma Number 33: Brisbane Brewing Co. … There’s a new “Robert” in town! The Verdict: It has been 25 weeks and 25 Chicken Parmigianas since I anointed the Calamvale Tavern Parma as the frontrunner for the “Robert” Parma award as my best Parma in Brisbane and this week the Brisbane Brewing Co Parma topped it. The reasons are pretty simple: this dish had the best chicken piece, best sauce, best ham and best chips I have tried on this quest. All the other aspects of this meal were very good too and that means there is a new “Robert” in town! Chicken Piece: As I mentioned in the preamble, the chicken piece on this chicken parma was the best I have tried so far. It was perfectly crumbed, with some herbs supplementing the flavor in the crumbing, and perfectly cooked. Whilst not a massive piece it was quite thick and tasted great! Tomato Sauce: I have mentioned before on this blog how much I love tomato sauce and this Napoli sauce was absolutely perfect. It was rich and tasty and covered the chicken piece well. Ham: In a meal replete with excellence it is difficult to find a hero but I believe I found one in the ham. For a start there was so much of it, it had to be folded over and over on itself to fit on the chicken piece. Add to that that this ham was the best I have tasted so far on this quest and was easily capable of being tasted alongside powerful flavors from the chicken piece and the sauce and this aspect of the meal was its hero by a fair margin! Cheese: If I had to make one small criticism about this meal it would be that the cheese did not quite fully cover the chicken piece. It was only a very small way off but, for consistency, I have to mention it. Nonetheless, the cheese was perfectly melted and, again, tasted great. Side Dishes: Brisbane Brewing Co. provides you with a plethora of options when it comes to sides for its dishes, both hot and cold. I will not outline them all but, suffice to say, I decided to go with beer battered chips and apple slaw with ranch dressing. The chips, and I know I am becoming a broken record here, were the best I have tried in the last 33 weeks. They were wonderfully battered, perfectly cooked and well seasoned. The choice of the apple slaw was a departure from a garden salad for no other reason than I love apple slaw. This one was done very well and tasted great. I have not yet mentioned the flower that also adorned the chicken part of this meal. I am not one much for flowers on food and simply removed it! Presentation: What a great idea to serve the chips and salad in separate containers on a large white plate. It is a simple tool but in my view very effective and in keeping with my preference to NOT have the chicken piece on top of the chips. The presentation here nailed it! The Venue: Brisbane Brewing Co is located on Boundary Street, West End. It is a moderately new bar and restaurant with a brewery on site as well as a well stocked deli you can grab take aways from. Sometimes in places like this a teetotaler like me can feel very out of place, after all the whole set up of the venue hinges on patrons drinking beer. I could not have had a more comfortable experience though and was made feel very welcome by the bar staff. My chicken parma was on the expensive side at $27 but it was worth every cent. The final word: It has taken 25 parmas for there to be a change at the top of the leaderboard in my quest to find Brisbane’s Best Parma. It goes without saying that the Brisbane Brewing Co Parma is absolutely worthy of the top spot. The chef got everything (with the small caveat about the cheese above noted) right. The question now is: is there another parma out there in Brisbane to top it? Postcript: New readers wondering what I am talking about when I refer to the “Robert Parma” need to read the following post https://brisbanebestparma.com/2014/12/30/the-parma-awards-you-asked-for-it-and-here-they-are/. Regular readers who have forgotten the award structure ought also refresh themselves. 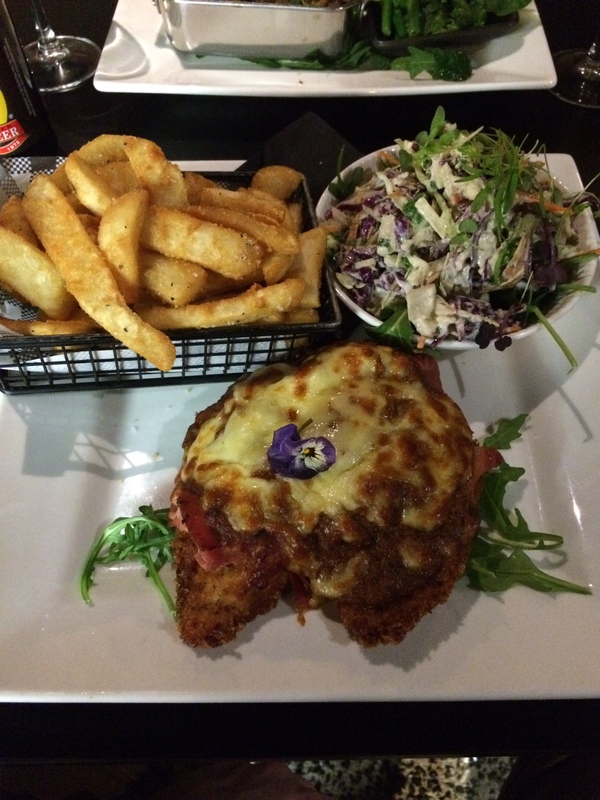 This entry was posted in Uncategorized and tagged Brisbane, Brisbane Brewing Co, brisbane's best parma, chicken parma, chicken parmigiana, food. Bookmark the permalink. 1 Response to Parma Number 33: Brisbane Brewing Co. … There’s a new “Robert” in town! I like the presentation too. $27 is a bit on the steep side, though. How much without the pansy?